Suleika’s Torte - Do You Know The Muffin Man? Notes: The chocolate batter is quite thick, like a brownie. With only a single mixing bowl, this cake is labour intensive because the upper layer requires beating the butter and sugar, then whipping the egg whites separately. 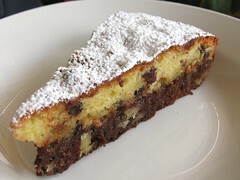 I would omit the raisins from the top half if I made this again; the finely minced mixed peel provides a nice enough contrast with the chocolate and walnuts. This European-style torte is dense and rich and has a pleasing blend of flavours and textures. Very nice.